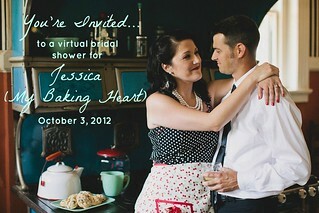 In just a few weeks my super sweet friend Jessica, from My Baking Heart, will be tying the knot with her fiance, Chris. She’s obviously a smart girl, because October is THE best time to get married. 🙂 To honor the beautiful bride-to-be, our friend Nikki, from Pennies on a Platter, organized a virtual bridal shower, and I couldn’t be more excited to participate! Jessica is a Southern Belle and one of the most genuinely sweet ladies out there! One thing I really love about her is that she is just as passionate about cooking and baking as she is about football at her alma mater, TCU (Texas Christian University). When deciding what to make for her shower I wanted to tie together all of my favorite things about her! 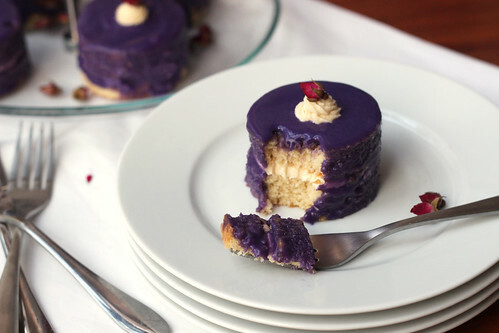 Something sweet, dainty, and, of course, purple! The mini-cakes I decided on are like a cross between petit fours and Little Debbie zebra cakes. I decided to coat them with white chocolate ganache instead of poured fondant because…well, it just tastes better (and reminds me of zebra cakes, an old childhood lunch favorite!). I won’t promise you that the white chocolate was much less work than poured fondant, but the taste was worth it in the end. Congratulations, Jessica!! I am so happy for you and wish you a lifetime of happiness! To see what other bloggers made for this special occasion check out the round-up on Nikki and Jessica’s blogs! Preheat oven to 350 degrees. Grease and flour a 9×13* (or jelly roll, if you want thinner cakes) pan. Set aside. In a liquid measuring cup, stir together vanilla extract and milk, set aside. In medium mixing bowl, whisk together flour, baking powder, and salt. In a another mixing bowl, beat together the sugar and butter until light and fluffy. Add the eggs one at a time and beat to combine. Alternate adding the dry ingredients in 3 increments and the wet ingredients in 2 increments (starting and ending with dry ingredients), mix until combined. Pour batter in to prepared pan. Bake for 25-30 minutes, or until a toothpick inserted in the middle comes out clean and cake begins to pull away from the edges of the pan. Allow to cool in pan for 5 minutes, then flip out to cool the rest of the way. *I used a 9×13 pan because that is largest size that will fit in my oven. The cakes were about 3/4 of an inch once baked, and little over 2 inches total when stacked and filled. Using a 9×13 pan and a biscuit size cutter, I was able to make 6 stacked cakes. I think thinner cake and smaller cookie cutters could yield more than a dozen. In a saucepan, whisk together the flour and milk and cook over medium heat until the mixture thickens (I would compare it to mashed potatoes). It is very important to whisk continuously so clumps don’t form. This took me about 4-5 minutes, but it’s best to go by texture. Set milk mixture aside in an ice bath and allow to cool completely. In a medium bowl, (or bowl of a standing mixture fitted with a whisk) beat together the butter and granulated sugar until light and fluffy. Add the vanilla and beat for 1 minute. Add the cooled milk mixture and beat on high for 3-5 minutes. If it looks separated, keep beating. Place white chocolate and butter in a glass or metal mixing bowl. Set Aside. In a small sauce pan, scald cream (cook until boiling). Pour the hot cream over the chopped white chocolate and let stand for 1 minute. Gently stir the white chocolate and cream together with a whisk until smooth. To color, be sure to use gel food coloring. Once the cake is completely cool, use a cookie cutter to cut cakes into desired shape. Pipe filling onto half of the cakes. Place another cake on top of the piped filling. Place cakes on a wire cooling rack. Pour chocolate ganache over the cakes and allow to drizzle over the edges. Use a spatula or spoon to smooth around tops and sides of cake. It may take more than one pass to completely coat. If needed, place cakes in the fridge for 15-20 minutes to allow the chocolate to harden, then add the second round of chocolate and smooth. After the final coat, allow to chill in the fridge again to help harden the shell. Jessica! Seriously!? These are gorgeous! Okay, please don’t mind as I gush a little bit… first, your site is absolutely ADORABLE (your beautiful header immediately put a smile on my face, and that quote seems like it’s a perfect fit for you too!). I would love to get some advice from you on how to create such a fun and welcoming environment for readers. Second, I was super impressed by your drop dead gorgeous mini cakes, with every detail tended to right down to including one of Jessica’s wedding colors through the ganache, and delicately adorning each cake with little flower buds. So sweet, and truly beautiful presentation… I’m confident they’re as delicious as they look- I only wish this shower was in person so I could dig in and taste! Being a part of this event has been so much fun, and what a wonderful bonus to be introduced to another fabulous blog (and blogger). I’m looking forward to reading more and visiting often! Thank you so much for your lovely comment. I hope I have the pleasure of hearing from you again soon 🙂 Feel free to get in touch any time! Hope you have a great day! Well you just put a big huge smile on my face! Thank you so much for kind words!! I agree, it’s fun to find fabulous new blogs through these virtual communities. 🙂 Looking forward to reading more on your blog soon! Those are unbelievably cute! Completely perfect for a bridal shower. Too, too cute! 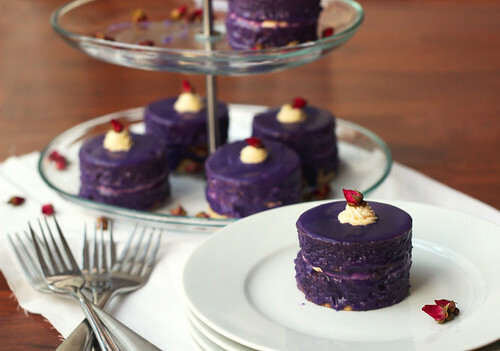 Mini cakes are so perfect for bridal shower and the purple really takes them over the top. Once again, gorgeous work! Ahhh, these mini cakes speak to me! Sooooooooooooo gorgeous and cute! I could have a couple dozen of those all to myself. 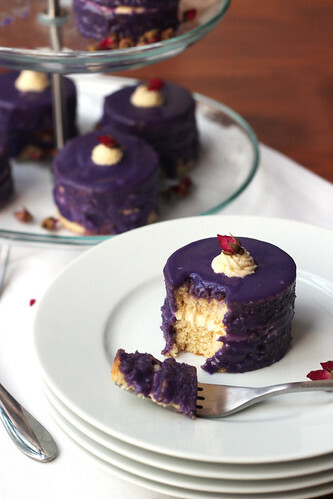 Wow, those little cakes are absolutely gorgeous! Love the color and that you chose ganache over fondant. I would love one or two right now! i used to love zebra cakes too, and beg my mum to buy them. your homemade version is so beautiful–and from jessica’s comment i can see was touched by all the work you put into them.